1. Provide Value. People want advice. That’s why how-tos and tutorials are two of the most popular types of posts. Honestly, no one really cares about that picture of your dog sleeping. By contributing useful content, you will attract the right readers that are actually interested into your product. 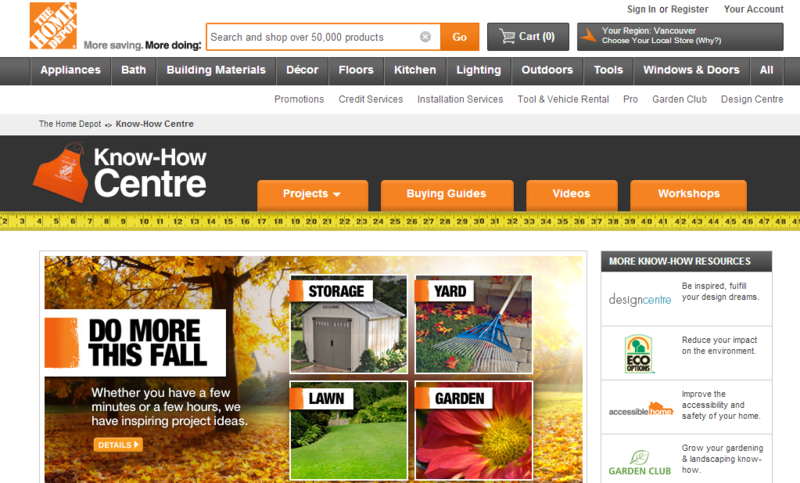 The point of your business blog should be about giving instead of receiving – The Home Depot does a great job of that. They feature how-tos, makeover ideas, reader’s photos, and more. Sharing information you find useful and non-promotional gains people’s acceptance – which leads to trust. 2. Headlines do matter. The headline is the first part of the article that the potential reader sees- and it should be the first thing you write. This way you will know what direction you are headed in and you will stick to it. The headline should be direct and reflect the article accordingly. People don’t like being mislead, it gives them a bad taste in their mouth. 3. Don’t be a copycat. It’s alright to have a blogging mentor. It’s great to admire the success and take the advice they provide. For instance, Refinery29 might be your mentor. Great! They’re doing an awesome job. However, you have to draw the line somewhere and create your own identity. Find an aspect of your business that is unique or advantageous and focus on that. There’s a difference between watching the competition and becoming the competition. If you’re worried you’re a copycat, that’s probably not a good sign. For a reality check, take a look at your company’s values and analyze the similarities. 4. Consistency. Strive to create consistency with your blog posts. Regardless if it’s once a week or once a day, it’s important to be reliable. Don’t just disappear for a month if you usually post once every day. If you feel comfortable posting once a week, post once a week.The more you on fresh content is crucial to increasing your website’s rank. 5. Add a call to action. Prompt them to engage with your business, because they most likely won’t without your guidance. Encouraging people to comment on their opinions about a topic or your blog post is smart. Why? You want people interacting with your brand, talking about it and giving you constructive feedback. 6. SEO Friendly. As mentioned in the first point, how-tos and tutorials are one of the most popular types of blog posts. Not only do they provide value for others, they provide value for your SEO because people are always searching for them. Make your blog under a subfolder as opposed to a subdomain. This is because search engines keep different metrics for domains and subdomains. Subfolders are double the work because they’re searched separately and not with the domain. 7. Promote your blog. You went through all of the trouble to write and edit the blog post, so why not share it wherever possible? Social media monitoring sites such as Hootsuite make it easier to share across multiple platforms. Put links to your articles on Facebook, Twitter, Google+ and even Pinterest if appropriate. You also have the option to submitting/posting on social bookmarking sites such as Delicious, Digg, or StumbleUpon. This way your article has a chance of being featured on a well-ranked website. 8. Be patient. Many people give up blogging because don’t see instant results. That’s not how it works. Refer to the below graph (courtesy of SEOmoz). Sometimes it can take longer than a year to attract a dedicated following. If you follow the above tips, you should be well on your way to having a group of people that regularly check your blog. Social Media & Content Marketing at Wishpond.